Warrnambool Veterinary Clinic is happy to share with you some exciting new information in the fight against calf scours. 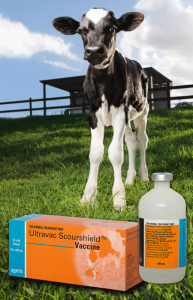 We are are pleased to offer the best calf scour protection available – Ultravac Scourshield. In recognition of the significant start-up costs in establishing Ultravac Scourshield with your herd, we have negotiated a special, limited time offer. We are very pleased to announce a package that provides the second dose FREE. Ultravac Scourshield now has an extended broaching claim. The product can be stored and used for up to 63 days (9 weeks) after first opening. * This extended broaching claim, coupled with Ultravac Scourshield’s unique flexible dosing schedule, means it is easier than ever to integrate Ultravac Scourshield into your farms’ dry off program. Other scours vaccines should be used or discarded within 12 hours of opening. Other scours vaccines should be used or discarded within 12 hours of opening. The widest vaccination interval – 3 to 9 weeks between the first and second dose. (Compared to 4 to 6 weeks for the competitor product). Flexible dosing to fit in with on farm activities – second dose or annual booster can be given up to 2 weeks prior to calving. (Compared to 4-6 weeks prior to calving for the competitor product). Water-based formulation for reduced injection site reactions and Is in stock and available now through Warrnambool Veterinary Clinic. There’s no excuse not to take action against calf scours. Ultravac Scourshield – Less Scours Losses, More gains. LIMITED TIME OFFER DON’T MISS OUT! * Store unused material upright, at 2°C to 8°C (refrigerated).